Give St Petersburg’s Hermitage Museum the attention it deserves on a 3-hour private tour. Skip the lines with your pre-booked ticket and professional guide, and see the highlights of the Winter Palace, once home to Russia’s tsars; and principal Hermitage galleries, famously home to some three million treasures. Ogle the opulent palace staircase, Throne Hall and other rooms as your guide shares anecdotes of the rulers who used them. Then, explore the galleries to view artworks by Michelangelo, Da Vinci, Rembrandt and more, as your guide recounts their artistic secrets. Very disappointed with this tour. 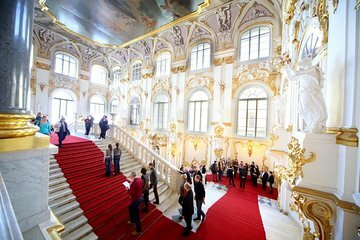 My partner and I had been looking forward to doing a tour of the Hermitage and had been our first trip to Saint Petersburg. Unfortunately our guide turned up looking as if he had been ill ? and had little knowledge of the Hermitage e.g. 'That's stained glass over there'. We decided to tour it ourselves eventually. If you do not want to spend hours wandering around and trying to find the best pieces of art - this is the way to do the Hermitage in 3 hrs. My guide - Dmitry - was knowledgeable, polite and very nice. The price is not too bad for a personalized tour to your liking. Highly recommended! This was an absolutely great experience! The tour guide was fantastic: I would definitely recommend any one with to take this tour. Hermitage was fantastic.